More than 200,000 gallons of oil spilled from the Keystone Pipeline near Amherst, South Dakota late last week, yet further expansion of the pipeline’s bigger brother, Keystone XL, was approved by the state of Nebraska on Monday. TransCanada, the company that owns both pipelines, shut down the Keystone Pipeline last Thursday morning at 6 am after detecting a drop in pressure, indicating a leak. About 5,000 barrels of oil spilled onto privately owned land roughly 200 miles north of Sioux Falls, South Dakota. The company is still investigating the cause of the pipeline’s rupture. Just three days after the oil spill, Nebraska’s Public Service Commission decided the fate of the Keystone XL pipeline’s route through Nebraska. Caving to pressure from Nebraska’s conservative legislators as well as industry and labor groups, the five-person commission agreed to allow the pipeline to cross through Nebraska. However, the pipeline must follow an alternative route. While the pipeline will enter and exit the state in the originally proposed locations, the commission will require its route to follow an existing pipeline’s path. This change will make responding to leaks more efficient according to regulators. The U.S. Environmental Protection Agency reports that 10-25 million gallons of oil spill each year. Not only do oil spills destroy habitat, kill plants and animals, and compromise agriculture, they also threaten public heath by contaminating drinking water and degrading air quality. Thursday’s oil spill came exactly one year after Native American protesters were sprayed with water cannons in 23 degree weather as they attempted to stop the construction of the Dakota Access Pipeline through North Dakota, citing oil spills as a primary concern. This week’s On The Radio segment looks at the pending Bakken oil pipeline project which would stretch from the Bakken oil fields in western North Dakota to oil refineries in southern Illinois. If approved, the project would run through 18 Iowa counties. President Obama’s historic decision to strike down the Keystone XL pipeline could be undermined by another proposed pipeline running through Iowa. A proposed pipeline starting in North Dakota’s Bakken crude oil fields and running through 18 Iowa counties is getting closer to state approval, with Governor Terry Branstad signaling his approval for the use of eminent domain for pipeline projects in November. Activists and landowners have been at odds with Texas-based Dakota Access, the company proposing the pipeline, for months as they try to establish eminent domain for the pipeline on private land. Most of the pipe would be underground, causing major concerns for soil and water quality as topsoil is removed and compacted during installation. Unlike Keystone XL, the Bakken pipeline doesn’t need executive approval from President Obama because it doesn’t cross an international border. Instead, the pipeline would need approval from the Iowa Utilities Board, which began public hearings on November 12 with a decision coming in December or January. A Des Moines Register poll found 74 percent of Iowans oppose the use of eminent domain for pipelines. For more information about the Bakken pipeline, visit IowaEnvironmentalFocus.org. 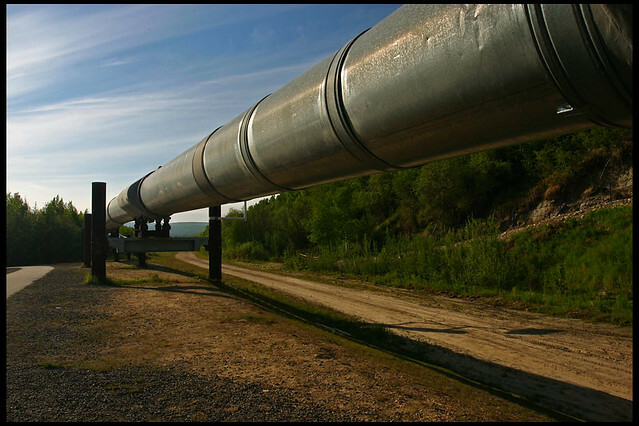 This week’s On the Radio segment covers the debated Keystone XL pipeline. Listen to the audio below, or continue reading for the transcript. 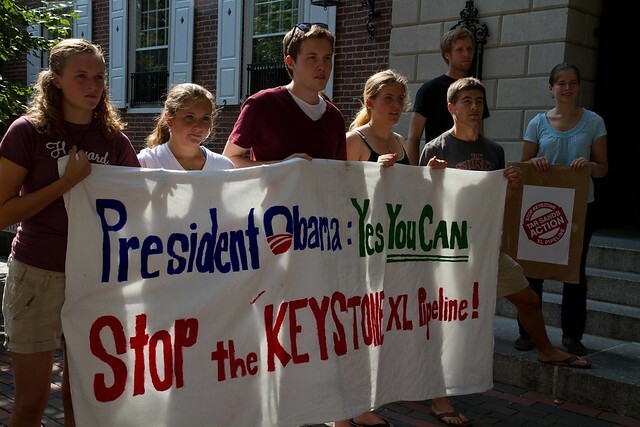 Keystone XL protesters. Photo by Talk Radio News Service, Flickr. Vice President of the Pine Ridge Oglala Lakota Nation Tom Poor Bear will speak at the University of Iowa on October 11 about the Oglala opposition to the Keystone XL pipeline. Poor Bear, a longtime American Indian activist, is a leader in the Native American opposition to the pipeline. The Oglala Nation argues that the pipeline violates their territorial rights and endangers their water resources. The speech will take place at 1:30 p.m. in Room S401 of the Pappajohn Business Building.